Home decor lovers rejoice, because farmhouse style decor is not going anywhere! One of the best ways to incorporate the fresh farmhouse style in your home, is with a sliding barn door. All you need is a doorway, a door, and a set of the best barn door hardware! The size of the door frame: Will you need a single door, or a double door to cover the space? Clearance above the door frame: Some hardware sticks out above the door frame, is there room for the style you like? Weight of the door: For a light wood door, you can use lighter hardware. For heavy doors, or glass doors, make sure you get heavy duty hardware to support the door properly. 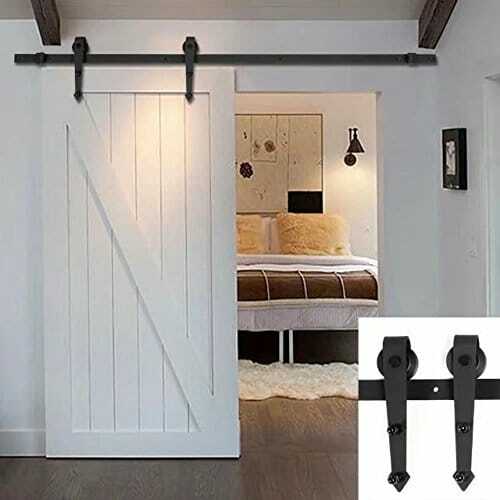 Here are some of the best barn door hardware kits you can get to achieve the classic yet cozy sliding barn door look, in no time! 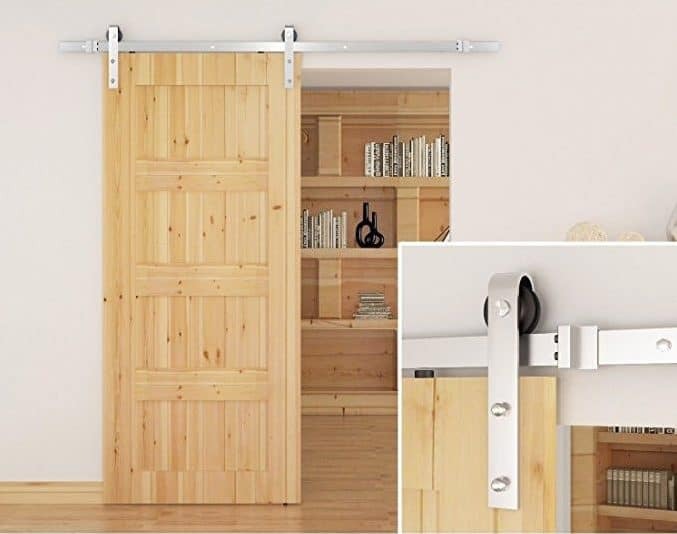 This set of barn door hardware by CalmTime give off that chic farmhouse look, for a very reasonable price. We love the look of the arrow style hardware tip, because it will give any door that vintage feel immediately. It’s also a great choice because the hardware is coated in a high quality carbon steel powder, which helps withstand extreme capacity, and is super corrosion-resistant. CalmTime also makes this arrow style sliding door hardware in 5 different sizes, and also makes sets for double sliding barn doors. This set is also made in 2 other hardware styles, to provide you with a high end custom look, for a great price. This DIY Barn Door Kit by DIYHD really gives off that rustic look. This sliding door hardware is very similar to traditional vintage styles, and is made from a sturdy steel material. It can support a max weight of 200 lbs, and a door thickness of 35-40-45mm. One thing to keep in mind with this set is that the roller part of the door is made from a sturdy plastic. This is to prevent the annoying squeaking noise that metal rollers can develop as they age, but you’d never be able to tell they are plastic by looking at them. DIYHD makes this style of barn door hardware for doorways between 5 ft and 8ft, so you’ve got tons of size options. Another thing to keep in mind with this set is the clearance over the door for the sliding wheel. This kit does take up more space than some other sliding barn door designs, so consider if you will have enough space. 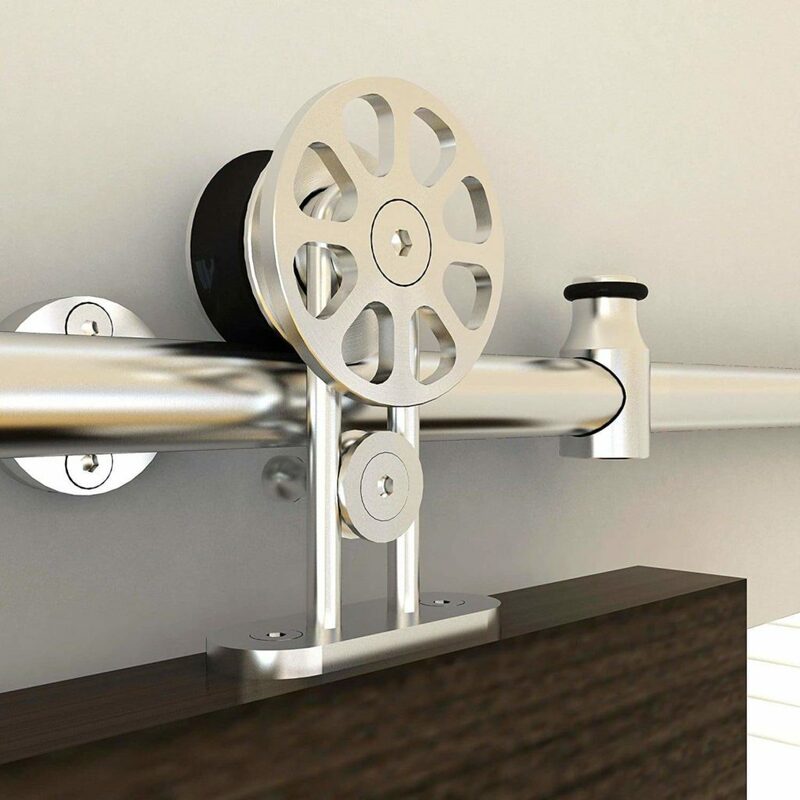 This modern take on the barn door hardware look is a real winner. This sliding door hardware by SMARTSTANDARD really bring farmhouse function into the modern age with this gorgeous stainless steel set. These kits can fit doors from 5 ft all the way up to 13 ft, so you can get the perfect custom look for your home. Not only does SMARTSTANDARD provide super detailed instructions, but they’ve also got an life time guarantee in you’re unhappy with your barn door hardware. The package includes all the needed hardware for your size of door, and the stainless steel can even be used on outside doors. This set will look as great on a pantry door as it would on a patio door, and we love the beautiful steel color, making it a top pick for best barn door hardware kit. This set is easily one of the least expensive, and most stylish options for an interior barn door. 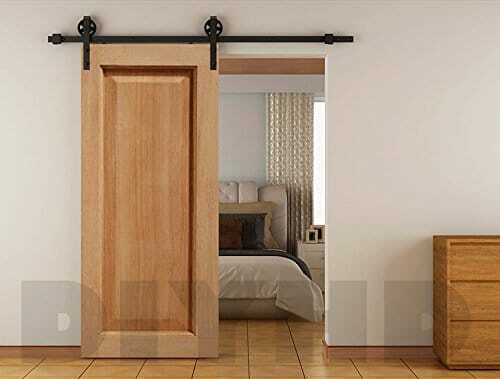 This set of sliding barn door hardware by Unionline really gives off an upscale farmhouse look. This set is also super affordable, and comes in a few different styles. These barn door sliders will work on door frames as small as 5 feet, all the way up to 13 feet. The hardware is also covered by a 5 year factory warranty to guarantee that it’s smooth sailing with your new sliding doors. This hardware is great for small spaces, where you need the space saving functionality of a sliding door, and a stylish look. 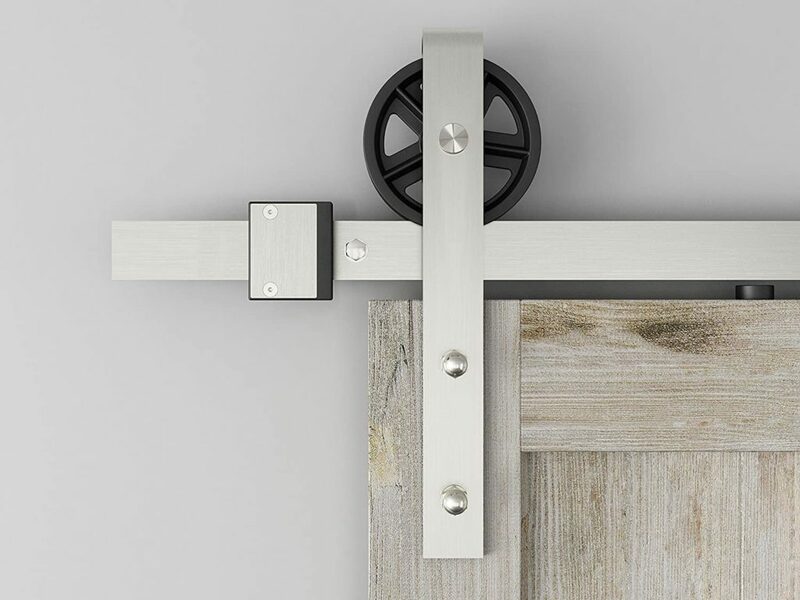 This set of barn door hardware from DIYHD features a modern stainless steel finish with a rustic spoke design. 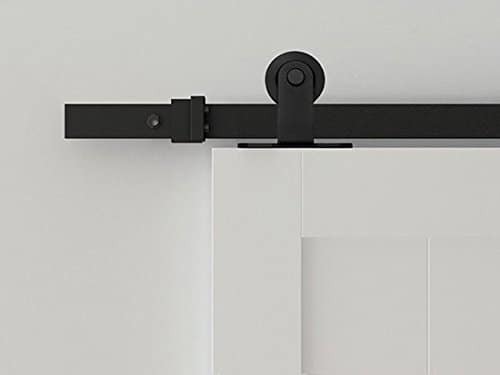 This sliding door hardware is super unique because it’s two toned, and which really makes it stand out from the crowd. It’s made from a brush steel, and is sturdy enough to support a door up to 200 lbs. This barn door set is available for doors from 5 feet up to 10 feet, and can be used as a double door set. Like the other sets with rollers the roller is made from plastic to produce the least amount of noise possible when the door slides. It is a great choice for best barn door hardware because it is the perfect blend of modern materials and timeless design. This stainless steel barn door hardware set from Custom Service Hardware, is like a work of art. It’s very large and attention grabbing, but it is beautiful. This heavy duty sliding hardware is great for really heavy doors, and can be used in a 8 ft door frame. This barn door kit such a great choice, because it really looks like a custom piece. For not a lot more money that the competitors, this sliding door set really looks like it was hand made by a blacksmith. The set includes everything you need to achieve this beautiful look, however set up will take a little longer with this bigger set. Another cool feature is that this design holds the door from the top instead of the sides, so it is a great choice for glass doors, or pretty doors that you don’t want covered by hardware. We are rounding out our list of the best barn door hardware, with this beautiful DIY Barn Door kit by Custom Service Hardware. This set is a classic style, color, and even better- a great price! This set looks best on thinner doors, although it can hold up to 200 lbs. The simple black rollers are very stylish but don’t require a ton of extra over head clearance space. 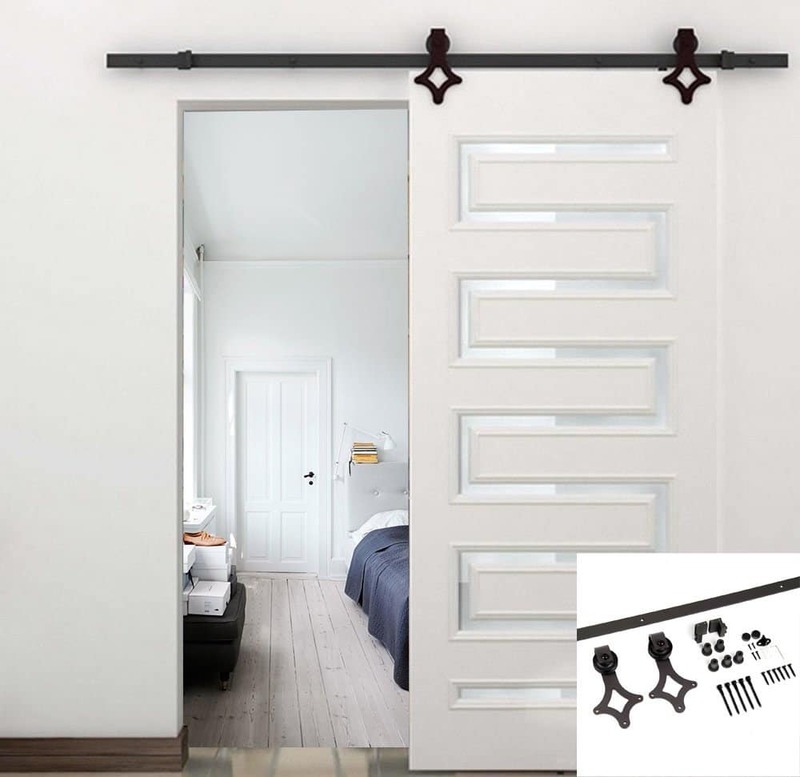 This barn door hardware set includes all the materials you need to assemble it, and you don’t have to worry about door thickness because the attach from the top of the door. Overall, these make a lovely choice for a interior barn doors, and are extremely affordable for any budget. And there you have it, the best DIY Barn Door Hardware, and Barn door kits! Any of these choice will have your home looking farmhouse chic in no time!